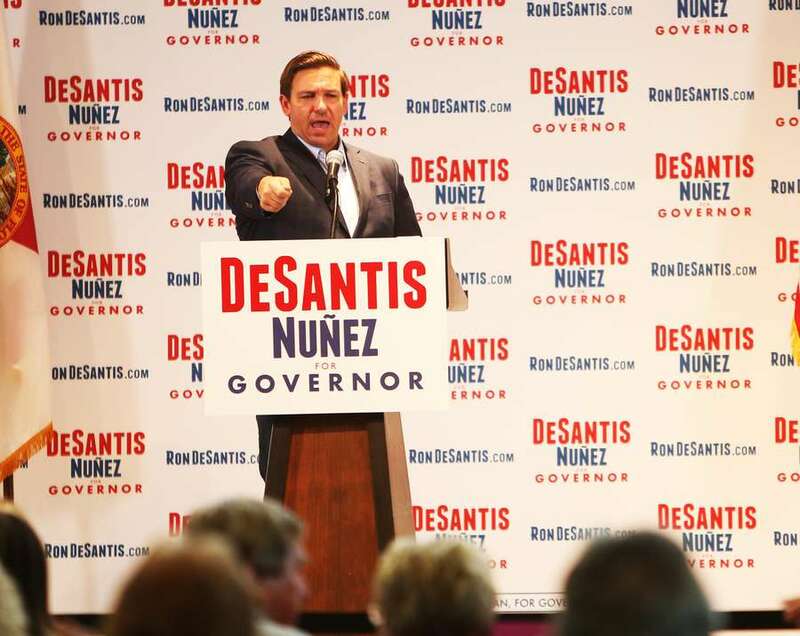 In addition to appearing in major urban areas, DeSantis has been stumping in scores of suburban enclaves. TAILYR IRVINE | Times Ron DeSantis points to the crowd during the DeSantis rally at the Saint Nicholas Community Center and Conference Hall in Tarpon Springs on October 27, 2018 in Plant City. With five days remaining in Florida's most contentious governor's election in decades, Republican Ron DeSantis is shoring up suburban enclaves and returning to his roots by rallying with President Donald Trump. While some strategists believe that a campaign's last push should emphasize rallies in the state's most populous cities, DeSantis has instead been visiting places like Coral Springs, Melbourne, Tarpon Springs and Sun City Center — in addition to a few appearances in big urban areas like Jacksonville and Miami. His running mate, state Rep. Jeannette Nuñez, has been a constant presence in her home turf of Miami. This scalpel strategy is based on internal polling and modeling by the campaign, which reveal areas where DeSantis could be vulnerable, and is working to boost turnout in those places. Some of these enclaves should already be assumed Republican strongholds, a fact that could spell out concerns that conservatives aren't ready to turn out for DeSantis. Democrats have used the videos of some rallies to taunt DeSantis over small crowds. But Alex Patton, a Gainesville-based GOP strategist who is not working for the DeSantis campaign, said this is a smart tactic to hone in on specific populations where candidates feel they can do better. 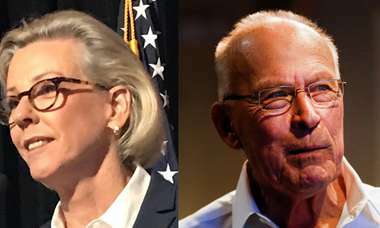 Specifically, he said there is a "clean break" of college-educated Republican women, many of whom live in suburbs, from the rest of the base for many Republican candidates. "I think it's the totality of the Republican administration," Patton said. "It's been two years of chaos and for whatever reason college-educated women don't like it." While many polls show Gillum with a small lead, the race is anything but decided. And the GOP has had more ballots cast in early voting so far. "I get the sense that (the DeSantis campaign) is finally beginning to campaign with a little more professionalism and is getting their act together," said Aubrey Jewett, a professor of political science at the University of Central Florida. 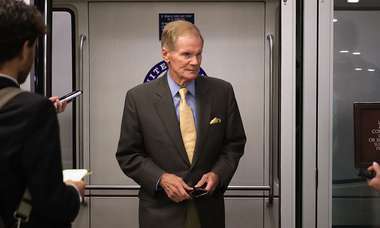 He said that DeSantis' campaign immediately after he won the primary was in clear disarray because of his controversial "monkey this up" comment on Fox News. After weeks of headlines highlighting DeSantis' associations with right-wing figures who have made racist statements, the campaign hired a new campaign chair, Susie Wiles, who helped Trump to victory in the nation's largest swing state and who has steered DeSantis' campaign back on track. In addition to energizing the base, DeSantis is also trying to capture more moderates by portraying himself as the law-and-order candidate and championing other popular issues like lower taxes and cleaner water. His campaign has seen a rush of police union and sheriff endorsements in recent days, amounting to more than 50 sheriffs, according to the campaign, including Pinellas County's Bob Gualtieri. Earlier this week, the Republican Governors' Association released a TV ad featuring conservative sheriffs saying they had "concerns" about Gillum. "Andrew Gillum is connected to the most radical forces in Florida," Flagler County Sheriff Rick Staly says in the ad. They're referring to Gillum's support of a criminal justice activist group called the Dream Defenders, a group best known for its month-long protest at the state Capitol following the 2013 acquittal of George Zimmerman, who shot and killed Trayvon Martin, an unarmed black teenager from Miami-Dade, in 2012. Gillum signed a pledge that included support for the group's "Freedom Papers," which contain language that has offended some in law enforcement. Gillum has been supported by some other sheriffs, such as Russell Gibson of Osceola County and Walt McNeil of Leon County. 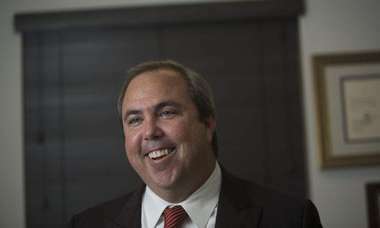 "The mayor has been a strong ally of law enforcement in Tallahassee, investing in additional officers to help reduce crime across the city," campaign spokeswoman Johanna Cervone wrote in a previous statement. "As Mayor Gillum has previously said, he will not take money from the private prison industry and instead will invest in community policing, smart justice and strategies that work with communities to reduce crime and create better opportunities for all Floridians." Against this backdrop of the back-and-forth over policing comes the two Trump rallies in Fort Myers and Pensacola, designed to motivate Republicans in a state where Trump has tied his own success to a DeSantis win. And top administration officials like Kellyanne Conway and Vice President Mike Pence have pitched in to stump with DeSantis, too. "If you guys take action and you guys join me and work hard I'm confident we'll be successful on November 6th," DeSantis told a crowd at a Wednesday morning event at a restaurant in Punta Gorda, before launching into what's become his de facto general election campaign slogan: "And we together we will be protecting Florida's future for generations to come."